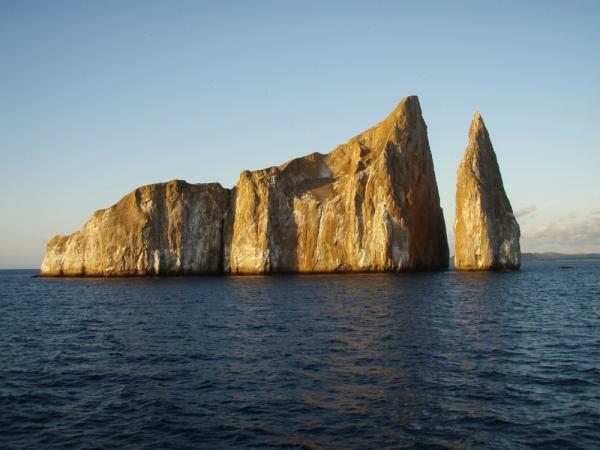 Explore the Galapagos Islands aboard the Aida Maria. 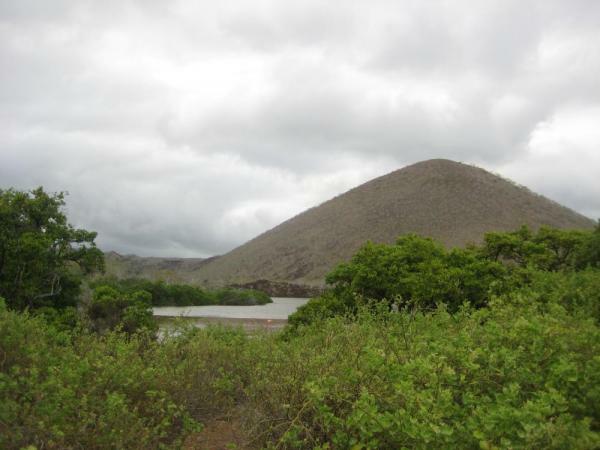 Visit some of the most popular destinations such as Bartolome, Genovesa and Floreana. Experience a wonderful time snorkeling, hiking, viewing wildlife, and exploring volcanoes. Your bilingual guides help you learn about the history, culture, plants, and animals of the Galapagos. 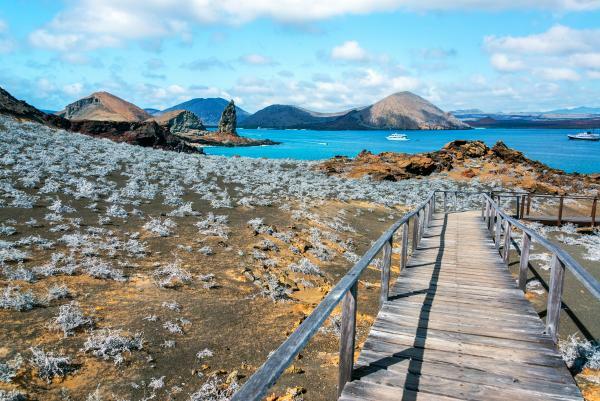 Enjoy the wonders of the Eastern Islands of the Galapagos on this 8-day cruise. Fly from the Ecuadorian mainland to the islands on an early morning 90-minute flight. As you prepare to land in Baltra, peer out the window. The landscape below seems out of this world - and it is for you have come to a place like no other. The Galapagos Islands are unique to the world and you are about to see why. 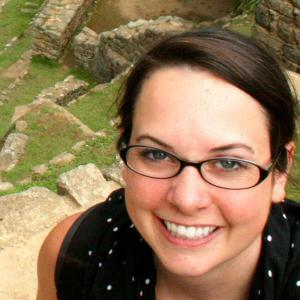 Your bilingual naturalist guide greets you at the airport and assists you through customs. During lunch they introduce you to the islands and specifically the flora and fauna you encounter at the first destination, Las Bachas Beach. 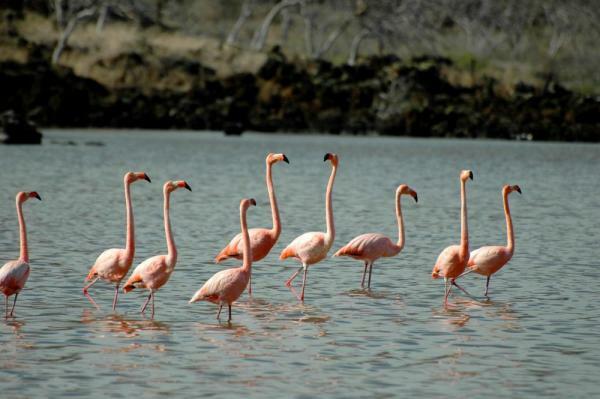 On the sandy white beaches of Las Bachas, take a close look at a sea turtle nesting area and a lake frequented by leggy pink flamingos and other migratory birds. Afterward, cool off with your first dip in the deliciously blue Pacific Ocean (snorkeling). In the evening, the crew prepares pre-dinner cocktail on the yacht before the welcome dinner. If the night is clear, as it usually is, the stars above bedazzle; look for the Southern Cross, the Big Dipper (turned up-side down! ), and Orion. After breakfast, visit Genovesa, or Tower Island, located in the northeastern part of the Galapagos (less than half a degree north of the equator). Anchor at Darwin Bay, which is located on the southern part of the island, and is actually the caldera of an extinct, partially eroded volcano, with the surrounding cliffs forming the inner lining of the rim. While the origin of the name Tower Island is not known, one can imagine it had something to do with these towering cliffs. The tour is a long, fairly-easy walk, but it is usually hot and dry here, so you may want to carry some water. After a wet landing on a coral beach, the trail begins in an area where there are several swallow-tailed gulls. As you walk back from the beach, look at the variety of Opuntia cactus and mangroves. Following the walk there is time for snorkeling. Tower is an outpost for many sea birds (as Española is in the south). Interestingly, there are almost no land reptiles on Tower, only very small marine iguanas. This is attributed to the direction of the ocean currents, which wouldn’t have carried the terrestrial animals here. Visit El Barranco during the afternoon then return to the boat for dinner. Bartolome Island, which at its highest point is 114 meters, is one of the most photographed vistas in the archipelago. This island is quite young and quite volcanic, therefore, it's relatively unpopulated; only a small handful of die-hard plant and animal species have survived long enough to call this lava-land home. Then snorkel on the island's golden sand beach where you swim with penguins. In the afternoon, visit nearby Sullivan Bay. At the turn of the century a huge lava flow spilled right down to the sea and today you can stroll across this black volcanic expanse, admiring its time-frozen ripples, bubbles, and ropes. Arrive to Daphne Island early in the morning. This island is a cone formed by the accumulation of volcanic ash, which is home to thousands of birds such as blue-footed boobies, frigatebirds, tropic birds, and many more. There are no landing docks on Daphne Island, but the ship navigates around this volcanic cone, so binoculars are recommended to get a good look at the birds. Daphne has been a great research site on which many scientists have spent years studying the behavior of Darwin’s finches. Afterwards, head to Black Turtle Cove, which is a red mangrove lagoon on Santa Cruz and is a nursery for many sharks and rays. It’s also a great location to observe mating sea turtles during nesting season. Here, you may find large groups of resting white-tip reef sharks, schools of golden rays and spotted eagle rays, and a few marine birds like blue-footed boobies and pelicans. After lunch, the ship navigates for a couple of hours to Cerro Dragon, where there are opportunities for snorkeling. After some time in the water, the ship makes a dry landing on lava rocks. Cerro Dragon is a small bay on the west coast of Santa Cruz and got its name from the many land iguanas that live in the area. Land iguanas are endemic to the Galapagos Islands, where they have found good mating and nesting areas. Start the day in Puerto Ayora, where you may visit the world famous Charles Darwin Station as well as the giant tortoise rearing center "Fausto LLerena ". This is one of the best places to see giant tortoises, including the place where Lonesome George used to live in the Galapagos National Park center. Here, find baby, hand-sized tortoises, between the ages of one and five years old, and marvel at how they achieve such large sizes as adults (500 lbs or more!). Galapagos tortoises are believed to have a lifespan of over 100 years, so the young ones have a long life ahead of them as long as they receive the protection they need. Santa Cruz Island is home to the largest town and economic center of the Galapagos, Puerto Ayora. In this portside town you can buy souvenirs (postcards, t-shirts, books, etc.) of the islands. Check out the unique Galapagos handicrafts at the local market. After shopping in Puerto Ayora and lunch on the boat (guests may dine in town if they desire), explore the highlands or “ parte alta ” of the island, which is a moisture-rich area with fertile volcanic soils. Learn about the vegetation and animal life of this zone, often strikingly different than that found at lower elevations. Darwin’s finches, yellow warblers, and bright red vermillion flycatchers fly in and out of the moss-covered trees. From this high vantage point, be treated to beautiful views of the surrounding archipelago. Start your day on Floreana, one of the larger islands in the archipelago. Ask your guide to tell you about its mysterious and interesting human history of the island, from its first human settlers to the actual population. Your first stop is Punta Cormorant. Here you can follow a footpath to a lagoon inhabited by flaming-pink flamingos. At the end of the road, head to a white sand beach which is a green sea turtle nesting area and a superb spot for watching sea birds and sea rays. Back on the yacht, skirt the island’s coast until you arrive at La Corona del Diablo or the Devil’s Crown, a sub-marine crater that offers some of the most spectacular snorkeling in the Galapagos. This is a great spot for seeing the wide array of tropical fish, many endemic to the islands, including purple sea stars and spiky sea urchins. The crater’s most thrilling undersea creatures, however, are the white-tipped sharks. As with most of the creatures in the Galapagos they are unperturbed by your presence, so you can swim in their company freely and fearlessly. After returning to the boat for lunch move on to Post Office Bay, where the island's original post office (really only a wooden barrel) was established around 1793. The current system still functions as it did three centuries ago: Visitors drop off unstamped letters and postcards AND pick-up whatever mail they can hand deliver themselves when they return home! Espanola is one of the most magical of all the islands. As your dingy brings you to shore see sea lion pups sunbathing with marine iguanas and blue-footed boobies nesting in between, and nearby maybe a Galapagos hawk. If it is booby mating season, watch the bonded pairs do the infamous booby dance (if it’s not mating season, ask your guide to demonstrate - after all it’s their job to teach you about the local fauna!). As you follow the footpath around the island, pass hundreds of blue-footed booby nesting sites including one colony of masked boobies. There is a good chance you can see the thief-like frigatebird (which has the habit of stealing other bird's food), as well as the stunning red-billed tropicbird and the nocturnal swallow-tailed gull. If it is the right time of the year (mid-April to December) you can also encounter the giant waved albatross. Apart from a few pairs that breed on Isla de Plata, off the Ecuadorian mainland, all of the world’s 12,000 waved albatross breed on Espanola Island. At the end of the breeding season, the entire population leaves the island and heads out to sea, where they spend years without touching land; four or five years may pass before the fledglings return to Espanola. As you make your way around the island pass by El Soplador, a giant blowhole that explodes to heights reaching 25 feet. In the nearby tide pools you can often find lounging sea lions enjoying the blowhole’s misty spray. Following lunch on board the yacht, visit Garner Bay, a great place for sunbathing, swimming, and snorkeling. Lionfish, flycatchers, and Galapagos hawks keep you company as you relax under the rays of the evening sun. Dinner on the yacht completes your day. Arrive early in the morning to San Cristobal, the capital of the Galapagos. The first site will be Isla Lobos, a very small islet made of volcanic rocks that gets its name from the colony of Sea Lions (Lobo de Mar in Spanish) that live there. 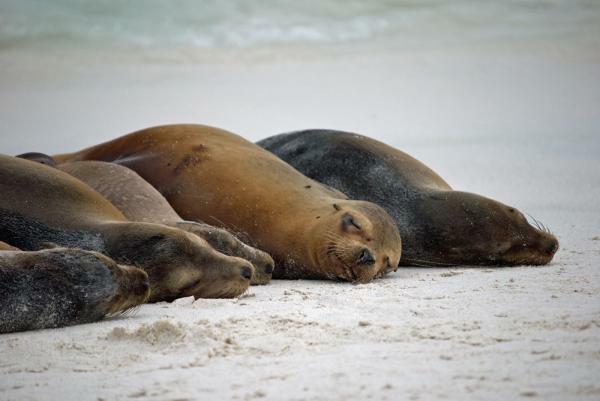 Here you can observe the behavior and interaction of Sea Lions living in a small community. Before taking the flight back to the mainland you will have some time to visit the town on your own for last minute shopping or people watching in the Galapagos. Transfer to the airport. No matter which part of the Galapagos Islands you'd like to experience, this boat has an itinerary for you. Balancing efficiency, comfort, and economy, the Aida Maria's 16 passengers will enjoy great food and good service all for reasonable prices. Standard cabins have upper and lower bunks.